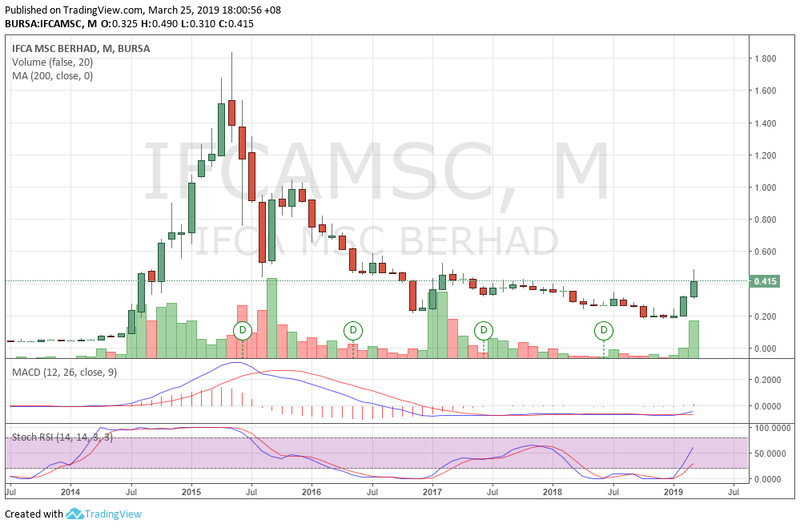 Home IFCAMSC Roger1001 The Explosive Tech stock in 2019 " IFCAMSC "
The Explosive Tech stock in 2019 " IFCAMSC "
IFCA MSC Bhd is engaged in the research and development of enterprise-wide business solutions. The company provides business software solutions for the property industry. These properties cover shopping malls, chain stores, residential, industrials, commercials, resorts, hotels and recreational sports clubs. It operates through two geographical segments namely Malaysia and Foreign. The Malaysia segment includes turnkey e-business applications. Its Foreign business segment focuses on research and development center for all customized projects for China market. IFCAMSC latest quarter result posted an awesome result. This quarter result is the highest revenue in historical of IFCAMSC performance. Their net profit is the second highest in historical of IFCAMSC. 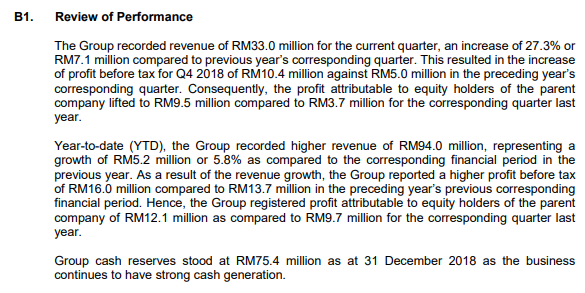 In 4th quarter of FY18, IFCAMSC's net profit rose 571% q-o-q or 142% y-o-y to RM9.0 million while revenue increased by 49% q-o-q or 27% y-o-y to RM33 million. Order book at historical highest 41.46millions. 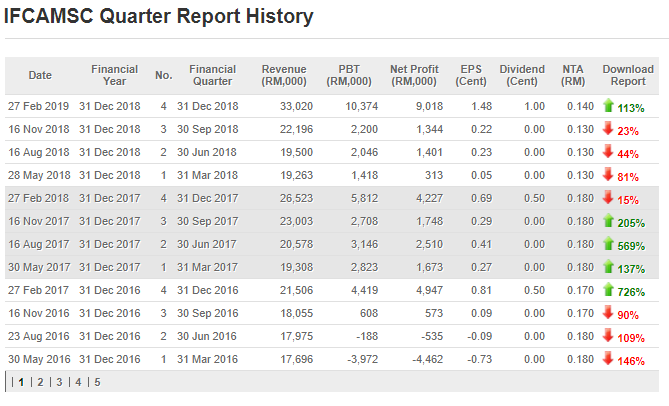 It is safe and conservative to assume that the company can make the same profit of 1.48sen per share per quarter, in the next 4 quarters for financial year 2019. That means its annual EPS will be 5.92 sen.
Based on P/E 15, the share price should be 5.92 X 15 = Rm 0.89. If you remember in year 2014-2015, IFCAMSC with strong earning able to achieve RM1.87 highest and it's P/E ratio hit highest 33.03. Technology stocks P/E usually is 20 compare with other industry. The group cash at healthy level with RM75.4millions. Moreover, they proposed 1cent per share dividend to shareholders. Not many growing tehcnology companies in malaysia can do that if they don't have a strong cash reserves. The dividend increased 100% compared with previous year dividend of 0.50cent per share only. The company growing well with it. Its cash reserve stood at histroical high of RM75.4 million or RM0.12 per share. The sales in Malaysia dropped slightly but the sales in Oversea increased a lot compared is FY17. Their net cash have increased to RM75mil and have yet to do any acquisitions. If they are able to acquire company that can provide profit gurantee and further expand their business. Their cash will be a great use to do that. - The group is no longer focusing on Gst or Sst software upgrade, they have been diversified its portfolio to provide software solution for poperty, construction and hopistality sectors. - The existing software are Property365, Contracts365, HR365, and Hotel365. - We expect these 3 existing software will continue to grow strong in next quarter. - The group has un-billed orders in hand amounting to RM41.46millions. Their group's order book in hand is at all time high. - The number of actual reserved units on the platorm increased nearly 100% from 6,000 units to 11,000 units. They are expecting this to grow even faster in the future. With the success of Property365 CRM sales, they will be launching a new Property 365 customer service apps. 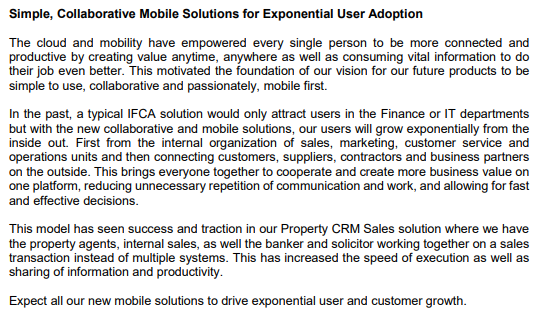 We are expecting this to be successful like Property365 CRM because they have huge data base with them already. No doubt their customers will continue to use their new platorm to improve their business. If you notice with their prospect for Property365, they are highly confident with their platorm. 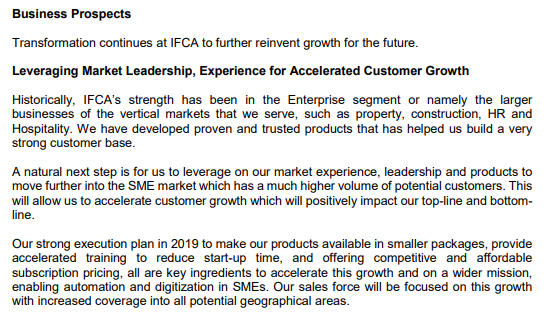 In last quarter prospect, IFCAMSC have mentioned that their Contract 365 businesses has more than dobuled in the current financial year and it's proven in this quarter. If you notice it, this sector should contribute quite a lot to their profit because they are highly optimistic with this solution will bring digital transformation and great business value to the construction market. Not to forget they recently signed with one of the largest construction companies in the country. HR365 is another EXCITING business to see whether it contribute a strong positive earning again to IFCAMSC or not. Their business model a more likely subscriptions as Contract365. Target to launch in Q2 2019. If you can see that their group management is trying their best to be innovative in the market and become the technology leader in the market. If this Hotel 365 able to increase the productivity of hotel operations. This will be a BIG contribution to the group in future. - If we take on yearly chart, you can notice that the stock is rebound from lowest with strong fundamental backup. 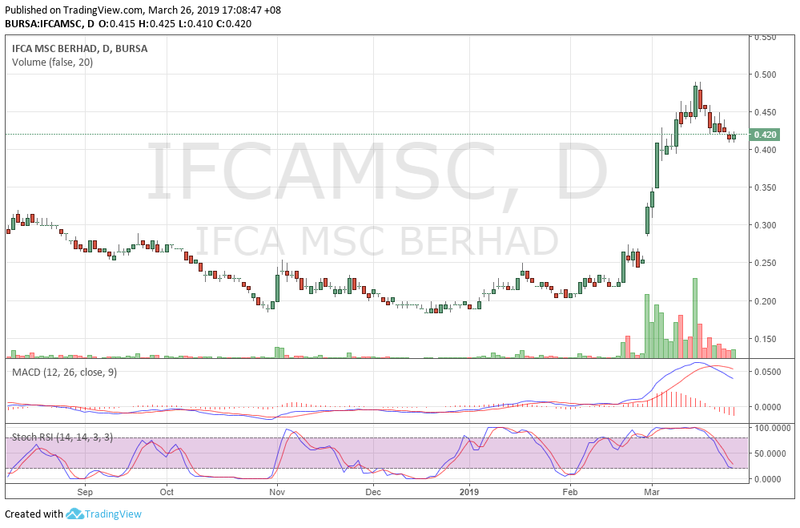 Volume interest of this IFCAMSC grow high after their latest quarter result released. -Based on daily chart, the share price up from 0.325 to 0.49 highest. However, At 14 March 2019, once IFCAMSC hit 52 weeks highest of 0.49. The stock have been retrace from year high and today closed with 0.42 slight rebound. A great stock requires slow and steady moving up. Support strongly built at 0.40 level. Based on TA, in short term this stock will test 0.60 target price if breakout from 0.49. This company previously because of GST software upgrade business become a spotlight in everyone eyes in year 2014-2015. However, the company successful proven they no longer depend on it anymore. The company successful diversified their portfolio into provide software solutions for property, construction and hospitality sectors. With net cash of RM75mil, it's exciting to see the company's next MOVE. Fundamental of the IFCAMSC is strong enough with improving earning of latest quarter result. Technical wise support at 0.40. With short term Target Price of 0.60.